Antonioni, a Filmmaker with an Eye for the Invisible Michelangelo Antonioni's depiction of alienation, in movies such as Blow-Up and L'Avventura, made him an art-house icon. He was awarded an Oscar for career achievement in 1995. 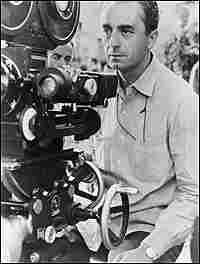 Michelangelo Antonioni behind the camera in 1965, about five years after he burst on the international scene. In 1995, Antonioni was honored with an Oscar for lifetime achievement. 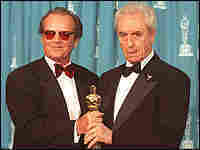 Jack Nicholson, who starred in the 1975 Antonioni film The Passenger, presented the award. Michelangelo Antonioni had a long, solemn face and hooded eyes — he looked like Humphrey Bogart. But the work of the Italian filmmaker, who died at home on Monday at the age of 94, couldn't be further from the traditions of Hollywood. Antonioni, whose name became synonymous with European art-house cinema in the 1960s, began his career as part of the Italian filmmaking movement known as Neorealism. Their style, says film scholar Peter Brunette, was obsessed with the visual — in the sense of what we can see, the visible surfaces of reality. But Antonioni was different from such gritty Italian Neorealists as Roberto Rossellini and Vittorio De Sicca, who focused on postwar problems; Antonioni preferred stark, existential meditations on the things you can't see and things you can't say. "And so you have to read between the lines," Brunette says. "Everything is powerfully expressive, but you can never exactly pin down what it means." The film that swept Antonioni before an international audience in 1960 was L'Avventura, which in Italian means both an adventure and a fling. Brunette says the movie is visually compelling, but the vague plot belies the title. The film, frankly, can be trying. "They're out there on this rock in the middle of nowhere on this island, and people are wandering around looking for someone, and can't find her," Brunette says. "L'Avventura was shown at the Cannes film festival, and people were booing — those supposedly sophisticated critics were booing and yelling 'Cut, cut!' .... And that film went on to become known as one of the greatest films of all time." It's true that Antonioni's visuals pack much more drama than his narratives. His characters drift through their movies with a preoccupied air, trying to connect, and failing. Much more important to the director, Brunette says, were the pictures they made — "the characters as graphic images." The liquid-eyed actress Monica Vitti was one of Antonioni's favorite graphic images. But the idea of using actors as props shocked Jack Nicholson, who starred in Antonioni's 1975 film The Passenger. On a DVD reissue of L'Avventura, Nicholson remembered Antonioni telling him that his performance was fine — but "'for me, the actor is a moving space.'" A moving space didn't even have to move, as far as Antonioni was concerned. He could find an epic in a blank stare. And why complicate a close-up with a distracting tear or smile? In the late '60s, Antonioni's movies — already abstract and philosophical — became even more so. "They're trying to talk more about the meaning of vision," Brunette says, "what it means to see the visual world — how do we understand it, how do we see reality through visuality and through vision." The most accessible example of Antonioni's vision may be the 1966 movie Blow-Up, about an amoral photographer blithely swinging through London. David Hemmings' protagonist snaps a series of voyeuristic pictures in a public park, outraging a woman who's caught unawares in his lens — and upon developing his film, he comes to believe he's inadvertently documented a murder. "But as he blows up the pictures more and more and more," Brunette explains, "he sees less and less and less." That's the kind of conundrum Antonioni cherished — how reality is called into question in what we see and what we don't. But Blow-Up may have been the director's last great film. "After that, I think, he became a parody of himself," Brunette says. "The character who was the protagonist becomes more obviously him." The photographer in Blow-Up, the TV reporter in The Passsenger, the director in Identification of a Woman, or the novelist in La Notte ... and the aging filmmaker played by John Malkovich in one of Antonioni's last movies. "Don't get me wrong, I'm not a philosopher," Malkovich's unnamed character says in Beyond the Clouds, which Antonioni co-directed with Wim Wenders. "On the contrary, I'm someone profoundly attached to images. I only discovered reality when I started photographing it — photographing and enlarging surfaces of things that were around me. I tried to discover what was behind them. I've done nothing else in my career." For Michelangelo Antonioni, that may have been enough.